EXCLUSIVE: Bank of Ireland to launch an Avios credit card – but is it worth the fee? 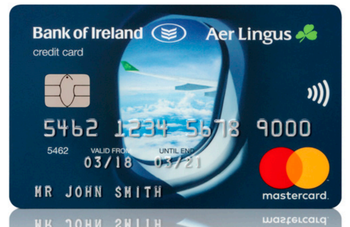 This is our preview of the “so new it’s not even launched yet” Aer Credit Card, offered by Bank of Ireland and earning Avios in Aer Lingus AerClub. The rewards credit card market in Ireland is pretty thin, not helped by a €30 annual tax imposed by the Government on each credit card you own. Historically the only way for our Irish readers to earn Avios via an Irish credit card was to earn SuperValu shopping points via a Bank of Ireland personal credit card. You could convert the SuperValu points to Avios in Aer Lingus AerClub. The rate was a stinker – you got 1 point for every €10 spent. The effective rate has got worse over the last couple of years as the transfer bonuses from SuperValu to Avios have shrunk. However ….. Ireland is about to get its first Avios / AerClub credit card, the Aer Credit Card. The issuer is Bank of Ireland. There is no website yet as the card has yet to launch. I would expect to see it on Monday. The link should be here – if it’s not live it will divert to the general Bank of Ireland personal banking site. As you can see from the image above, it looks very smart. What benefits does the Aer Credit Card offer? This is where the card gets interesting. I have been saying for a long time – in conference speeches as well as via HFP – that co-brand credit cards need to offer more than just points and miles, because the 0.3% cap on interchange fees makes points and miles difficult to afford. Aer Lingus has grasped the nettle. What you have is an airline card which is very low of mileage earning but strong on benefits. 1 Avios per €4 is exceptionally weak for a card which carries an annual fee if you compare it to the UK market. The fee is higher than the new Lufthansa Miles & More UK credit card (£79) which offers 1.25 miles per £1 you spend. The Aer Lingus card is offering 0.25 miles per €1. 2 free Aer Lingus tickets EVERY YEAR for spending €5,000 on the card. You receive two free tickets to any European Aer Lingus destination from Dublin, Cork, Shannon or Belfast. You need to pay taxes, fees and charges. The vouchers are triggered as soon as you hit €5,000 and are valid for 12 months. 2 Fast Track & Priority Boarding passes every year when travelling on Aer Lingus. Nice to have, but not hugely valuable. 2 Lounge Passes. This is more like it. Each year you will get two lounge passes to use at Dublin, Cork, Shannon or Belfast. This is worth €40+. Worldwide multi-trip travel insurance including winter sports. ‘Free’ travel insurance tends to vary from very good (Amex Platinum, Barclays Travel Pack) to pretty useless. Having looked at the policy document, the insured limits are VERY low – eg €250 maximum coverage per item lost or stolen, €50 for an 8+ hour travel delay, €150 per party for delayed baggage, a pitiful €3200 should your child under 12 be killed – but it does cover you up to the age of 80. You can download the policy document here. Note that there is no sign-up bonus. Interestingly, the small print implies that the free tickets are NOT taken from Avios reward availability. Aer Lingus appears to be making two tickets per short-haul flight available for credit card holders. Don’t get carried away by the apparent value here because ‘taxes, fees and charges’ make up the bulk of the cost of short haul flights. A further snag is that you need to book at least 30 days before travel which further restricts your ability to make a substantial saving on a pricey last minute deal. Booking your free flights looks messy ….. This sounds like a LOT of trouble to book a ‘free’ flight when the saving, realistically, is unlikely to be more than €10-€20 per person given that all taxes and charges are still due. Even using the free lounge passes and fast track / priority boarding passes is complex. You can’t just turn up with a voucher – you need to pre-book online. You would need to do the maths to see how this compares with any other Irish credit card you currently have. You should be able to recoup the value of the annual fee but that is not exactly a great recommendation. My personal rule of thumb is that the benefits I receive from a paid credit should be worth 2-3x the annual fee (including the value of the miles I earn over and above what a free credit card would get me). I don’t see that happening here for the majority of people. The Aer Credit Card will be available very soon via Bank of Ireland for residents of the Irish Republic. Does the falling £ make Marriott's flight ticket redemptions a good deal? Launch now appears to be next Monday.